● This machine is applied to filling such mediums as compress air,hydrocarbon mixture .Freon,DME, Nitrogen,and Carbon Dioxide and so on . It can produce various aerosol products. ● Filling system newly applied for air compressor equipment, are suitable for dosing filling any kinds of viscosity. No need to configurate a paste filling machine, can save lots of money. ● It can continuously complete gas blowing,feeding,filling,sealing automatically.With the original technical design, it is easy to operate saving time and effort. ● German PTFE seals, wearing-resistant, long lifetime up to more than 5 years. ● Its filling end is controlled separately, no discharging without filling；It is sealing with high quality for adopting oriented-sealing; The way of the oriented inflation in the charging end is accurate and efficient with minimal gas consumption. 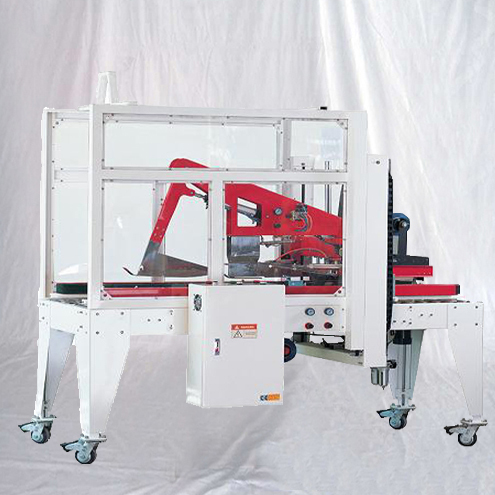 LG series semi-automatic filling machine has fully absorbed the advanced filling machine technology from the Swiss Pamasol Company, with high filling speed, accurate filling volume, high repetition precision, reliable sealing performance, strong anti-corrosion ability and simple maintenance requirement. 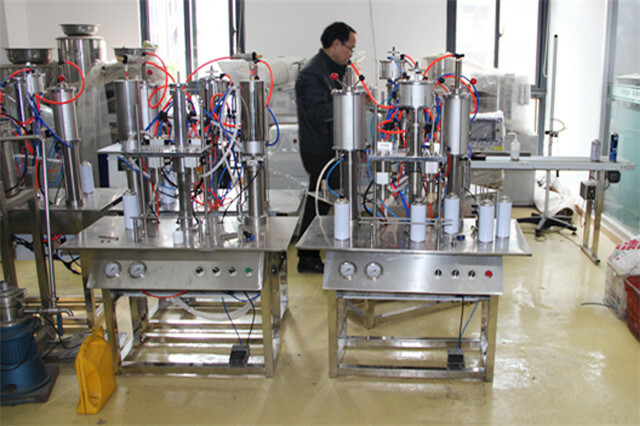 The machine is widely used for quantitative filling of aerosol products and other liquid mediums. Shown by the pneumatic principle in Diagram 1.1 and 1.2, LG series semi-automatic filling machine is comprised by filling head, content measurement device, and pneumatic component. Its working procedures are shown as follows: firstly, the liquid content will be pumped out from the containers, into the measurement device, and then adjusting the indicator drum to quantify the content. Place the aerosol can on the operation platform of the machine, push down the “inching” pedal value K1 to reverse the two-position, five-way and dual-air reversing valve V1; when the lower chamber of the small cylinder in the filling head inflows air, open the filling head to start the filling operation; meanwhile, the upper chamber of the cylinder in the measurement device will inflows air, push the quantified content in the feeding cylinder of the measurement device into the filling head and then press the content into the aerosol can (Attention: content will spray out if there is no can placed in position.) After the filling operation is completed, the piston in the upper cylinder of the measurement device will press down the control valve K2 in the connection plate, controlling the air impeder to reverse the two-position, five-way and dual-air reversing valve V1. As for this, the lower chamber of the upper cylinder in the measurement device and the upper chamber of the small cylinder in the filling head will inlet air, restoring automatically and waiting for the next filling operation. 3. 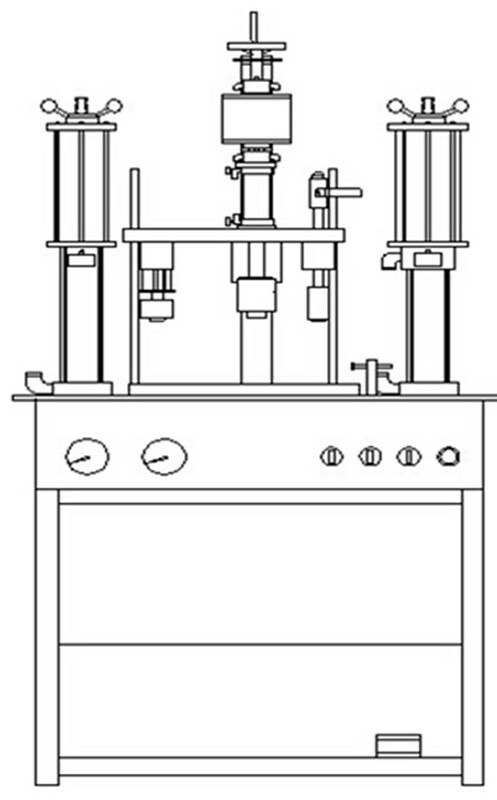 Setup of filling volume: before setup, it is a necessity to turn off the pressure relief valve at the air source jointer of the filling machine and to wait the compressed air in the machine to be emptied; or to pull the manual pipe air evacuation valve on the side of the measurement device to the evacuation position for air evacuation; turn the indicator drum in anticlockwise direction will increase the volume, and in clockwise direction will decrease the volume. When getting the required filling volume, turn on the pressure relief value to restore the pressure to 0.45~0.7Mpa; or to restore the manual air release valve on the side of the measurement device. On this basis, repeat the filling operation, until getting the needed filling volume. 4. Setup of filling head height: firstly release the lock-screw on the side of the slide holder and turn the hand wheel to adjust the height of the slide holder. In according with the height and size of different cans, the filling head shall be adjusted to let the cans go in the go out freely. In the meanwhile, the filling head shall be close to cans as much as possible. After the adjustment, fasten the lock-screw on the side of the slide holder. 5. 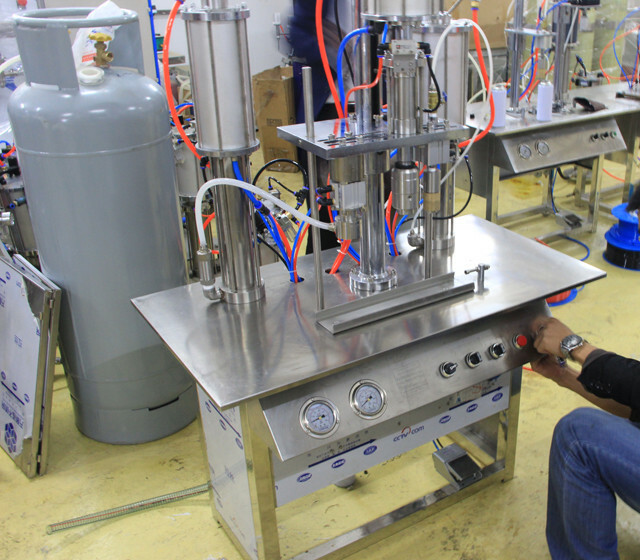 Setup of the position of aerosol cans: firstly, release the fastening screws of the two positioning block on the operation platform; adjust the position of the block to ensure the aerosol cans and the filling head are homocentric. Then, fasten the screw again. 6. 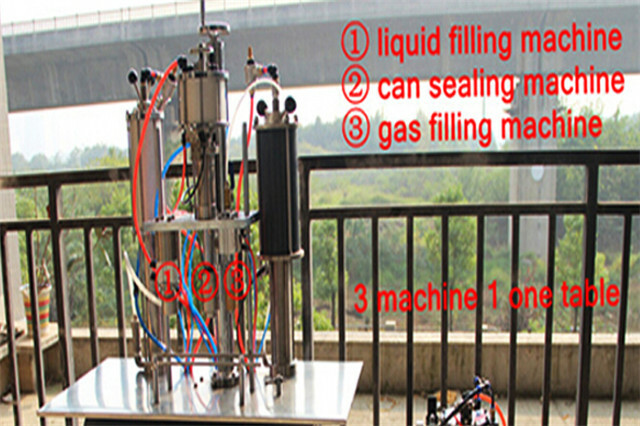 Setup of running speed: liquid mediums of different viscosity have different requirement on filling speed. Before adjustment, firstly, tighten the one-way throttle valve on the side of the measurement device, push down the pedal valve (inching) to do a test filling; slowly release the one-way throttle valve during the operating; on the premise of ensuring that the volume of each filling complies with the allowable error range with proper operation speed and stable running, fasten the one-way throttle valve. 7. Check the above adjustment procedures and then start the filling operation. Place the aerosol can between the two positioning blocks and being close to the positioning blocks; press down the (inching) pedal valve K1 to complete the filling. During the adjustment process, if the air cylinder can not be restored to the initial position, we may use button K3 in front of the operation platform for reposition. Attention: during adjustment and operation, if abnormal situation occurs, please restore the machine by pressing button K3. After finding and eliminating the fault, the machine can be started again. 1. Liquid medium inside the container is lower than the pumping pipe, so that air enters into the pipe. 2. Air mixing in chambers of the upper cylinder of the measurement device. 3. Abrasion of L-shaped sealing ring on piston in side the cylinder of the measurement device. 4. Foreign matters between the sealing body and the sealing gasket inside the one-way valve under the measurement device. 5. Foreign matters between the sealing body and the sealing gasket inside the one-way valve on the side of the measurement device. 6. Liquid filter should be washed frequently. FG1 semi-automatic aerosol can sealing machine has fully absorbed the advanced filling machine technology from the Swiss Pamasol Company, with high sealing speed, reliable sealing quality, as well as simple operation, adjustment and maintenance requirement. The machine is specially used for internal inflating sealing of global and universal 1-inch aerosol valve. Shown by the pneumatic principle in Diagram 1, FG1 semi-automatic aerosol can sealing machine is comprised by two groups of cylinders. The lower cylinder (compressing cylinder) drives the sealing head to press tightly the aerosol value to be sealed, while the upper cylinder is designed to complete the sealing operation. The working procedures are shown as follows: place the aerosol can to be sealed on the operation platform of the machine, step on the (inching) pedal value K1 to reverse the two-position, five-way and dual-air reversing valve V1, so that the upper chamber of the lower cylinder will inflows air. On this basis, the sealing head will go down to make the adjusting ring to press tightly the aerosol valve. By then, the concave surface of the piston rod of the lower cylinder will enter into the cylinder, giving out a signal to reverse the two-position, three-way, single-air reversing valve V2. As for this, the upper chamber of the upper cylinder will inlet air for sealing operation. After the sealing operation, the piston in the upper cylinder will push down the mechanical control stroke valve K2 to give out the signal to reverse the two-position, three-way, single-air reversing valve V1. Then, the lower chamber in the upper cylinder starts to inlet. After the piston of the sealing cylinder is restored, the lower cylinder will also be restored along the stroke. So far, a sealing procedure is completed, waiting for the next operation. 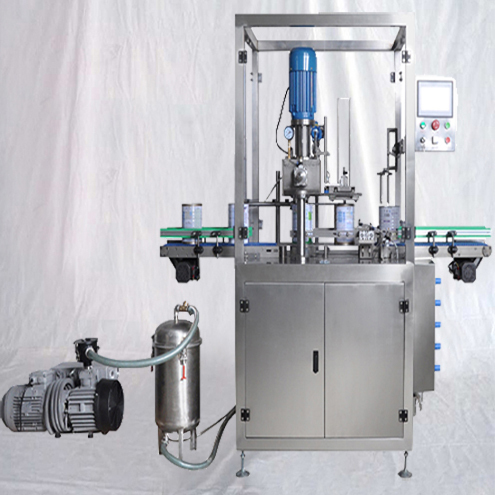 PG series semi-automatic propellant filling machine has fully absorbed the advanced filling machine technology from the Swiss Pamasol Company, with high filling speed, accurate filling volume, high repetition precision, reliable sealing performance, as well as simple operation and maintenance requirement. The machine is widely used for quantitative filling of propellant for aerosol products. 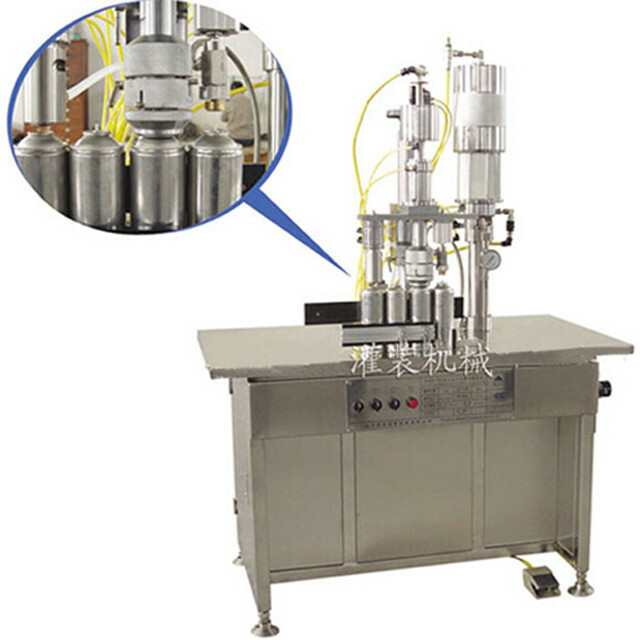 Shown by the pneumatic principle in Diagram 1.1 and 1.2, PG series semi-automatic propellant filling machine is comprised by filling head, propellant, content measurement device, propellant booster pump, and pneumatic components. Its working procedures are shown as follows: firstly, the propellant will be pumped out from the steel bottle or container, be pressurized by the booster pump to 1~1.2MPa, and then be injected into the measurement device. Adjust the indicator drum to quantify the propellant. Place the sealed aerosol can on the operation platform of the machine, step on the “inching” pedal value K1 to reverse the two-position, five-way and dual-air reversing valve V1; when the upper chamber of the small cylinder in the filling head inflows air, the filling head will press tightly on the aerosol can, and that the filling mouth will be opened. Meanwhile, the upper chamber of the cylinder in the measurement device will inflows air, push the quantified propellant in the feeding cylinder of the measurement device into the filling head and then press the propellant into the aerosol can (Attention: propellant will spray out if there is no can placed in position.) After the filling operation is completed, the piston in the upper cylinder of the measurement device will press down the control valve K2 in the connection plate, controlling the air impeder to reverse the two-position, five-way and dual-air reversing valve V1. As for this, the lower chamber of the upper cylinder in the measurement device and the lower chamber of the small cylinder in the filling head will inlet air, restoring automatically and waiting for the next filling operation. 2. Place the booster pump on the ground, and connect the propellant source to the entrance of the booster pump (Attention: the steel bottle containing the propellant should be better placed upside down.). Connect the exit of the booster pump to the filling machine (at the lower corner on the right side), and then connect the air vent on button valve K3 of filling machine to the shuttle valve on the two-position five-way dual-air reversing valve V2 at the booster pump (being used when the two-position five-way dual-air reversing valve V2 is not reversed). 3. Connect the air supply separately to the entrance of the booster pump and the binary jointer of air source processor of the filling machine. 4. Turn on the pressure regulating valve on the binary jointer of air source processor in the booster pump system to adjust the pressure of air supply. The pressure of propellant output by the booster pump shall be stabilized around 1~1.2MPa. 5. Setup of filling volume: before the adjustment, the pressure relief valve at the air source processor binary jointer of the filling system should be turned off. Wait until all compressed air in the system is emptied; or pull the manual pipe air evacuation valve on the side of the measurement device to the evacuation position for air evacuation; turn the indicator drum in anticlockwise direction will increase the volume, and in clockwise direction will decrease the volume. When getting the required filling volume, turn on the pressure relief value to restore the pressure to 0.45~0.7Mpa; or to restore the manual air release valve on the side of the measurement device. On this basis, repeat the filling operation, until getting the needed filling volume. 6. Setup of filling head height: firstly release the lock-screw on the side of the slide holder and turn the hand wheel to adjust the height of the slide holder. In according with the height and size of different cans, the filling head shall be adjusted to let the cans go in the go out freely. In the meanwhile, the filling head shall be close to cans as much as possible. After the adjustment, fasten the lock-screw on the side of the slide holder. 7. Setup of the position of aerosol cans: firstly, release the fastening screws of the two positioning block on the operation platform; adjust the position of the block to ensure the aerosol cans and the filling head are homocentric. Then, fasten the screw again. 8. Setup of running speed: Tighten the one-way throttle valve on the side of the measurement device; slowly release the one-way throttle valve during the operating; on the premise of ensuring that the volume of each filling complies with the allowable error range with proper operation speed and stable running, fasten the one-way throttle valve. 9. Check the above adjustment procedures and then start the filling operation. Place the aerosol can between the two positioning blocks and being close to the positioning blocks; step on the (inching) pedal valve K1 to complete the filling. During the adjustment process, if the air cylinder can not be restored to the initial position, we may use button K3 in front of the operation platform for reposition. Attention: during adjustment and operation, if abnormal situation occurs, please restore the machine by pressing button K3. After finding and eliminating the fault, the machine can be started again. Moreover, the pedal valve K1 may be cooperated with button valve K3 to complete the operation of propellant filling. The detailed procedures are shown as follows: firstly, step in the (inching) pedal valve K1; estimate the filling time according to the volume needed; when the time is up, immediately press down the button valve K3 to restore the cylinder and to complete the complement filling. 6. The booster pump filter should be washed frequently.